Consider finding your first job as a full-time occupation. It will occupy you every day and take up a large part of each day. The experience can be exciting, worrying, uplifting, exhausting, invigorating and challenging. We can also help you; further our expert advisory team are on hand to advise you on how to write a CV, interview techniques, and other application processes. Here are our favourite pieces of advice to help you when job hunting. Start each day as if you were going to work. Try and find somewhere to work, create your own place of work - e.g., the local library. The routine and format will help you focus and give direction to you and your goals. No- one will know you are looking for a job unless you tell them or ask them for one! You don't always have to ask someone else for a job, ask for advice, introductions, ideas - help in general. If they have a job that they think suits you anyone sensible will offer it to you. You lose nothing by applying to all nor asking anyone. Instead, you stand to gain everything. Follow every lead, don't leave time in between opportunities. Write instantly, follow up straight away and don't over think it for too long. You need to write at least one application and one random letter every day makes this your minimum target. Keep your CV updated and ready to be sent off with an appropriate covering letter at a moments notice. NB. make sure you save a copy of your basic CV and then update it or make it relevant, bespoke, to each and every job application. Read job descriptions carefully and try to emulate the tone or amplify the words that the employer has used in the description and on their website in your covering letter. Grow a thick skin, we know it is horrible you can shed it like a snake once you have a job. Rejection is an intense and tough experience, but it is inevitable, and you will just have to brush it off and move on very rapidly otherwise time will win out, and your self-esteem will begin to feel very fragile. Sadly, fewer and fewer companies acknowledge receipt of your application, and many do not let you know that you are not on their short list for the job. If they do not have enough manners to thank you (even just an electronic acceptance would be better than nothing) for applying then we can only suggest you probably are better off not working for them - we know that is not always true, but you have to explain it some way! If you enjoyed your interview or would love the job more than anything else in the world, then a follow-up email after your interview will not go amiss particularly if you can send it directly to the interviewer. Don't be smarmy, be genuine, thank them for their time, reiterate that it was a pleasure to meet them and that you particularly liked x, y or z. 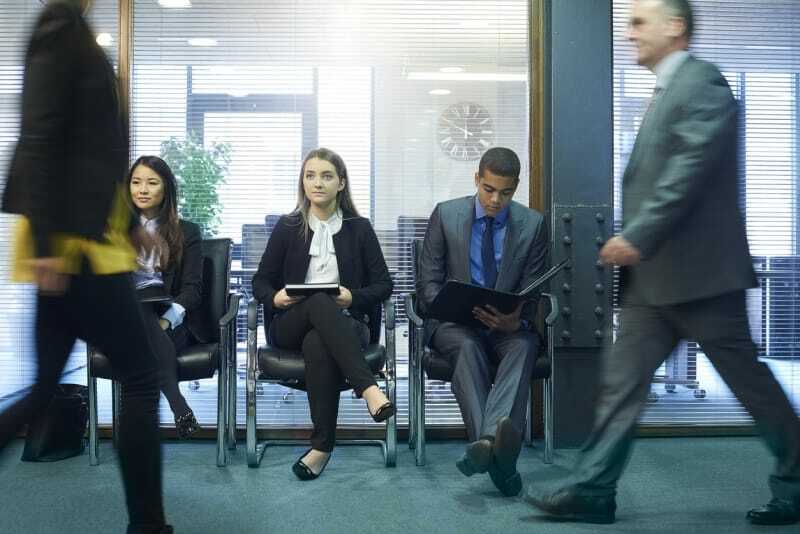 You may not get your perfect job as your first or even second job, but it is a given truth that it is always going to be easier to get a job and then look for a new one once you have one. So, take the job gain experience, up-skill and then look for the next role while being paid! While you are not employed working in any other capacity (paid or voluntary) in your spare time will help your self-esteem, may teach you new skills and if paid work will stop your wallet from becoming totally dry! Keep an open mind as you never know who you might meet and talk to along the way thereby opening more doors and increasing the chances of finding a job. It also shows employers you are willing and able. If you find interviews nerve-wracking find someone who will help you practice, a friend, family member or possibly a teacher. While you have time check out your interview clothing, polished shoes, tights without holes, a clean suit and if appropriate a tie. Have everything ready so that you are prepared and not stressing out a few hours before your important meeting. Attend events that are in the area of work that you are looking to work in. Network, network, network. If you don't know how to do this then ring us - we are experts! Relax, breath, it will happen. Bernadette John, our Director of Special Educational Needs, despairs at yet another pointless idea from The Department of Education. The school admissions system is, apparently, now taking the blame for the lack of social mobility which is blighting opportunities and depriving the nation of much-needed talent. About the number one UK trusted school guide. One criticism of grammar schools is that they take a disproportionate number of children from privileged backgrounds. A far smaller number of grammar school pupils receive the pupil premium than pupils in comprehensive schools. Buttle UK is a charity which supports disadvantaged children. One of its more imaginative and bolder initiatives has been to fund places at boarding schools for children who are thought likely to benefit from the opportunities this would provide. The project has been sensitively designed so as not to create divisions between children and their own families and social milieu. The initial furore over National Offer Day is over - although, of course, the next one - Primary School Offer Day - is only six weeks away and we'll have to go through the whole miserable experience again. We, at The Good Schools Guide, along with everyone else, get worked up on behalf of children who are not allocated their first choice school or, far more worrying, children who get offered none of their six choices. It isn't good enough and shouldn't be happening.